Vision Thailand (VT) is the coordinating body for a growing church planting movement among the poor and unreached in Thailand. They are focused on training and long term mentoring of new national leaders who build small, largely self-sustaining churches that replicate themselves. This partnership will provide opportunity for VT to utilise land resources they currently own, or have access to, for the purposes of income generation for church planting, assisting the poor in their churches, benefiting the broader community and funding the wider ministry. There are a number of avenues through which BHW could engage with VT however this first project is providing a loan to assist a bi-vocational church planter grow a new variety of corn called ‘Siam Ruby Queen’. This will also provide full-time employment for another church member to look after the crop and some part-time employment for pickers and packers during harvest. Aunty Holly (Naruemon Khamsaen) is a widow with many years experience church planting and pastoring alongside her late husband. 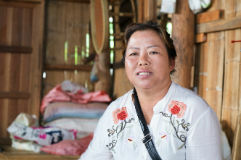 She felt called of God to pioneer a new church plant on her rural property in Nakin Nayok province, east of Bangkok. The church is called "Vision Thailand Church, Nakon Nayok". She inherited this land from her family and there are now four church families currently living on her property, and others in the area who attend. There are no other churches in this area. 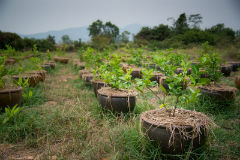 Aunty Holly is already growing lime trees on part of the property in specially designed pots that have been developed by a university nearby to keep the trees moist but not let the roots rot. She knows one of the research scientists who worked on developing the special pots, and this was how she found out about the opportunity. It is through this same connection that she has come to know about a new corn variety which has recently been developed and approved in Thailand. The corn grows waist high, is a purple colour when ripe, and is very high in vitamins and minerals. There is an opportunity to get into the market before the corn becomes more commonplace. There is only limited seed available from the agricultural university who has developed it, and Holly has secured permission to be one of the first trials of the seed. She will be able to buy enough seed for up to three Rai of land. Vision Thailand arose out of the frustration that the local church was growing very slowly throughout Thailand. Evangelism was largely ineffective, and the leadership was reluctant to try something different. A small group of pastors invested significant time and prayer in developing a constitution based on what they felt was a more New Testament church planting approach. Under this united vision and new strategy, they brought their churches into a single network in 2007 (Vision Thailand Ministry). In the first few years this was made up of about 50/50 existing churches and new church plants. The VT network of churches has continued to grow steadily. From the early days of three small churches joining together in 2007 to form VT Ministry, there are now 44 registered churches or home church groups currently under VTM in 2017. 80% of these churches have all begun as primary church plants in communities where there were previously no churches. In 2007 BHW's Thailand Partnership Facilitators were put in touch with Alan and Rosina Collingwood in Thailand through a recommendation from WEC International. At that time Alan and Rosina had been working there for about 12 years in the area of evangelism and church planting, and had not long moved to Chachoengsao, about an hour east of Bangkok, where they began church planting from scratch. That initial church plant has now grown into three small churches throughout the province, all with national leadership. During their first meeting Alan impressed with his commitment to and empowerment of the Thai church through Thai leadership and evangelism and has continued to impress over the intervening years. In 2011 they caught up with Alan again in Thailand and saw how his new focus and role in Vision Thailand was flourishing and how it had developed into a fast growing vibrant church planting movement. They have since met with Alan and Rosina numerous times both in Bangkok and New Zealand. BHW's Executive Director also met Alan during a visit in 2015 as well as meeting Aunty Holly and visiting the project site. The direct beneficiaries here are Aunty Holly and the people employed to tend the corn crop but indirectly many people will benefit as the farm generates income to fund the wider ministry of Vision Thailand. The key people have the expertise, financial and practical, to make a really good go of this project. There are widespread stakeholders who will benefit and potentially long term gains to be found through an initial investment. VT works to be self-sustaining, is thinking ahead and prepared to adapt the way they do things as they grow and learn. It is a testament to the quality of the people within VT that the bi-vocational pastors in the network want to help fund the wider ministry whenever they can. It is exciting to see a grass roots church planting movement that is experiencing steady and sustained growth. The key people involved are exceptional, passionate people who give all of themselves to the work of the kingdom. Alan is one of the founders of Vision Thailand Ministry (VTM), sits on the VTM Board, and is involved in mentoring and training new national leaders. His role involves coordination of the different aspects of the ministry and as the only non-Thai he is the main point of contact for overseas partners. Alan and Rosina (New Zealand missionaries) started working in Thailand in 1995 as part of the Bonds of Fellowship churches and served in this way for 12 years. They speak fluent Thai and have a good grasp of local context and culture. They moved to Chachoengsao in 2007 to begin primary church planting and handed over the work to Thai leaders they had raised up by 2010. They continue to support that Thai pastor and his family as a mentor and advisor, but took on more responsibility for the development of VTM from 2010 onwards. They now help with the training of new church planters at the VTM "Leadership Development and Church Planting School (LD & CPS)" and help mentor national leaders across the country through the growing network of small churches under VTM, as primary church planting remains the major focus. VTM began with Alan and two other Thai pastors in 2007. It has grown steadily since. Alan is a very genuine guy who wants to empower and serve the Thai church in whatever capacity God would have him. Alan and Rosina are passionate people who are utterly committed to God’s purposes and faithful to His call on their lives. Pastors Daniel and Jintanaa Khamsaen pastor Life Goal Church at Rama II, in VTM. Daniel has been a pastor for about 20 years and was involved in the development of VTM. Jintanaa has experience working in insurance prior to working alongside Daniel and has strong financial management skills. Pastor Daniel is the Thai chairman of VTM and is also responsible for helping mentor pastors in the network and training leaders. The VT Leadership Development and Church Planting School is run from their church building. Aunty Holly is a warm and generous woman with a real heart for reaching people for Jesus. She is pastor of her local church and also lectures in the church planting school in Bangkok. She is quite an entrepreneurial person and is using this gift not just for her own benefit, but also with a clear focus to grow the kingdom of God. 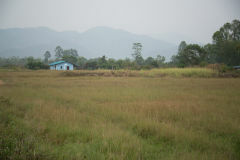 To grow the church at Nakon Nayok and utilise land gifted to VTM to generate income through growing corn that will fund the local church planting ministry and, in time, help fund the wider VTM work. 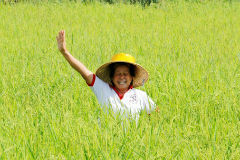 To provide a loan which will enable Aunty Holly to plant three Rai (1.2 acres) of her land with Siam Ruby Queen corn. It will also be necessary to install a sprinkler system with a pump from the fish pond to keep the soil water levels at an optimum level. It is anticipated that after 15 months (two plantings and time to harvest and sell) they will be in a position to repay the loan. My name is Mrs Nati. In the past I grew up in a village that had a church building in it, so I used to say I believed in God but I did not have a real walk of faith. I was living a hypocritical selfish life. I played cards, had other gambling addictions, was addicted to alcohol, and used drugs. I had an aggressive temperament and argued with my family or cursed people who opposed me. I was arrested and imprisoned four times but that did not help make me a better person or turn me from my old lifestyle. I did not enjoy being like that, someone that everyone hated. I tried so hard to change, but could not stop my sin or addictions, no matter how hard I tried. I presumed I would have to live with those habits and sins till I died. During that time, because of my addictions, I also had chronic pain in my internal organs, my ovaries were inflamed and I had terrible knee pain. When Pastor Somchai Arlee and his team from the Vision Thailand church came to my village, I responded to the gospel message and confessed my sins. God forgave me and changed me by His power. God delivered me from my addictions and healed me of my pain. I have been walking with God now for three years. I thank God so much that he has freed me from all my addictions and I now have great peace. I know I have changed dramatically and people in the village can't believe I am the same person. I have become more tolerant and forgiving towards others and no longer look for a fight with people who don’t agree with me. I wanted my home to be a blessing to the village I live in which has no church so I opened my home to be a place of worship to God each week. There are now about 30 believers who come every week. Initially many people in the village opposed me for letting the church meet in my house but now they have seen how much my life has changed for the better and can see I have found peace. The attitudes of people in the village have changed and they are now asking when we will build an actual church in the village. Praise God for his grace.